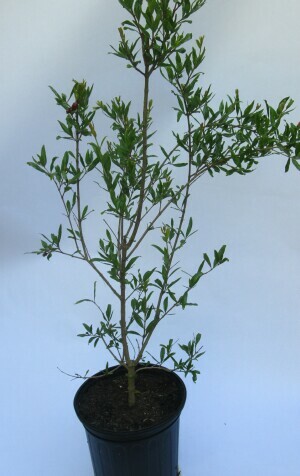 Punica granatum. 'Granada' is a bud mutation of 'Wonderful', with darker red flowers and earlier ripening, typically in August. Juice is deeply sweet without a cloying finish. Fruit, both inside and out, is a luscious burgundy color. The crown is red even when the rest of the unripe fruit is green. Hummingbirds fight over ownership of this pomegranate tree. About 3' tall, bushy, as of April 2019. Grown in 2 gal containers.